Now that you will be bringing your new best friend home, it’s important to have all the right supplies to make the transition a smooth one. If your best friend has already been home for quite some time, these items are still important items to have around and use on a regular basis to keep the harmony in your household. So grab your shopping list below and get to it – your best friend is waiting on you! 1) 6’ leash – This leash is good for bringing your dog out to the yard for potty time. With only 6’ of space to roam and sniff, chances are that if you stand in one spot and give him an indication that it’s potty time (by saying “get busy”, “go pee” or whatever you use), he will be more likely to eliminate when you need him to (rather than continue to roam and get distracted, which usually leads to an accident when you get him back inside). This leash is also good for limiting your dog’s options in the house when you are trying to teach a lesson and split your attention – i.e. teaching your dog to settle while you are doing computer work. In this situation, with only 6’ of space to move about, your dog will often realize that he can’t go into the other room to play with your kid’s toys, he can’t wander into the kitchen to jump on the counter, but what he CAN do is lay quietly next to you in this 6’ of space and take a nap. He learns to relax when you need him to and you get to do your work - Perfection! ​I prefer leather or cotton to nylon, and think the ones with a bolt snap enclosure (as pictured below) are more secure than ones with a trigger snap enclosure (which I have had come undone when my dog has rolled or leaned up against something). 2) 15’ long line – I don’t mean a metal line that you stake into the ground in your back yard; nor do I mean a retractable leash which is like a shoestring attached to a plastic handle and offers you little control. I mean a 15’ leash made of cotton webbing that looks like a regular leash only much longer. Sometimes they are referred to as “training leads” and you can often find them online or in a store packaged wrapped in a spiral. They come in 10’, 15’, 20’, 30’ even 50’ varieties, but 15’ is usually all you need (unless you also want to get a 30’ or so for playing fetch in a non-fenced area). I use this 15’ long line almost anytime I take my dog into social situations. It’s great because I can give him 15 feet of room to move when space allows (like if we’re on a trail or in a field), but if we’re on a narrow sidewalk I can also gather it up in my hand to give him only 4 feet of room. The biggest benefit to the long line is that you will more easily eliminate any pulling behavior on the leash because your dog will learn to walk respectfully with you. Your walk will be more about the emotional connection and less about a short taut leash forcing him to be with you, which is where the pulling usually stems from. At the same time, a long line is great for socialization because you take the pressure off by not requiring him to explore the world right at your side, which is very militant and usually doesn’t lead to confidence building. Instead, he will be able to explore in a more comfortable manner and will therefore be in a better headspace for learning. Whether you choose a traditional collar or a harness for your dog (or both, for different situations) is up to you. It really comes down to personal preference – which one you would prefer to deal with and which would be most comfortable for your dog. A traditional collar is something that can be left on all the time, since if it is fit correctly will not interfere with your dog’s comfortability and he will not be able to reach it to chew on it when you are not supervising him. 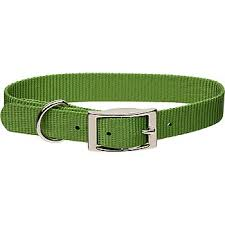 I recommend either a flat buckle collar (that fastens like a belt with a hole and tongue) or a martingale collar (which can also be adjusted but offers an additional section conducive to training). Collars that have plastic clasp have been known to break in extreme temperatures or situations so I don’t find them the most reliable. A harness can be a little easier for a dog to wriggle out of (mostly if it is not fit correctly) but moreso, I highly recommend taking off the harness when you are not walking your dog, as a harness is easier for your dog to reach and chew or get tangled in. The idea that a harness will stop your dog from pulling is more of a myth – it just means that he will be pulling with his chest instead of his neck. If your concern is with pulling, see my article on long line use and contact me so we can teach him to respect the leash by building his connection to you. 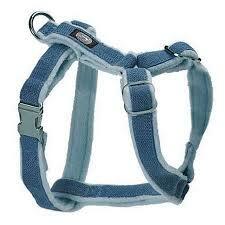 Whichever you choose, it’s important that the collar/harness fits correctly. How do you know what the correct fit is? When on, you should be able to slip two fingers underneath the collar/harness comfortably but not your whole hand and definitely not your wrist. Try pulling the collar up and over your dog’s head while it is clasped to ensure it won’t fit over the ears and the widest base of the head. With the harness, try sliding your dog’s front leg back through the harness or backing it up over your dog’s head when clasped. If the collar/harness stays put and doesn’t come off, then it’s a good fit and there’s very little chance your dog will be able to escape it and run off when the situation gets tough. Having a crate for your dog to go to is a lifesaver in so many ways – for both you and your dog. Some people may dislike the idea of crating their dog because they feel they are taking away the dog’s freedom, but the truth is that used correctly, the crate can be a very pleasant experience for your dog. Not only will a crate help your dog with learning how to hold his bladder in your home, but most importantly it will help you set clear boundaries for your dog in relation to house manners, social manners, and much more. If your dog has free access to everywhere in your home, you can’t help him learn the difference between good behavior and bad behavior because you can’t always monitor what he's doing as he’s learning. So when you have a ton of things to do and can’t split your attention in one more direction to help your dog learn the appropriate behaviors, having a crate to use as a casual “time out” for yourself is important. For more information on how to use the crate to your benefit and to make it a positive place for your dog, contact me – I can help! 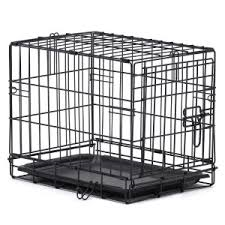 When looking for a crate, wire crates are usually more durable and more comfortably accepted by dogs over molded plastic Vari-kennel style airline crates. Select a size that is big enough for your dog to stand up comfortably but remember – most dogs like to curl up in a small ball when taking a nap so the crate doesn’t need to be a monstrous mansion. In fact, if it’s too big, your dog may soil in his crate on one side and sleep on the other – which is not the precedent you want to be setting. 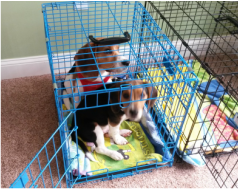 These adorable Beagle puppies love their crate so much, they are even willing to share! You might want to put something comfortable in your dog’s crate with him so he can cuddle up, or you may want to have a place for him to lay on while you are cooking dinner or watching television at night. These are great ideas and supportive in helping your dog feel comfortable with his place in your home. 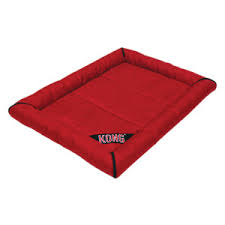 The best kind of mat (at least initially) is one that is not thick with stuffing, as many dogs will find this stuffing entertaining and will try to tear it out of the mat/bed when they are left alone or bored. 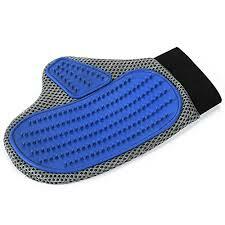 It’s best to have a mat that is flat but made of a comfortable material, maybe even an old towel or blanket. 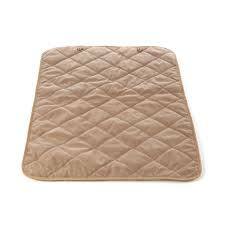 Inspect the mat to make sure that seams are intact, no loose threading, frays or fringes. Size-wise, find a mat that is just big enough for your dog – you don’t need one that’s the size of a throw rug. And when you first introduce your dog to the mat, I would do it only under supervision until you know that he has shown no interest in tearing it apart. If he does, you can make the effort to redirect him and teach him that the mat is not a chew toy (I can show you how to do this), and only leave him alone with the mat once he has shown that he respects it and will not ruin it. There are many different kinds of toys out there, all shapes and sizes and materials. Some hold up better than others. Some are cute but not very practical. 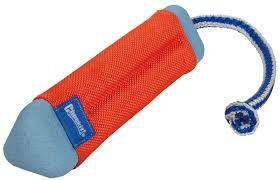 So when you are surrounded by a sea of dog toys, how do you know which ones are the best bang for your buck? First, avoid anything that has stuffing inside. Most of these toys are easily destroyed and a waste of your money (not to mention they can cause gastric upset for your dog if the stuffing is ingested). You will want to pick out some toys that are a strong material that is durable for chewing (since chewing is a very natural response to many emotions for your dog, and if you don’t give him enough appropriate options for taking out these responses, what usually ends up getting destroyed is your furniture). Additionally, you will want to purchase some interactive toys that can be used for playtime between you and your dog (and usually these are for use only under your supervision). It’s best to have a big variety of toys to rotate for different uses so your dog doesn’t get bored – keeping the novelty level up will increase their value. 1) Bones/Chews. 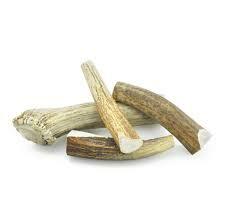 Natural sterilized bones (sometimes called white bones) and elk antlers are durable and hold up very well for strong chewers. 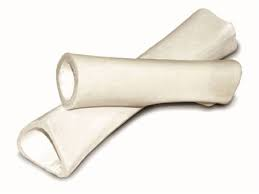 You can also find bones made of synthetic materials that are built to stand up to heavy chewers, and these can come in a variety of shapes and sizes. 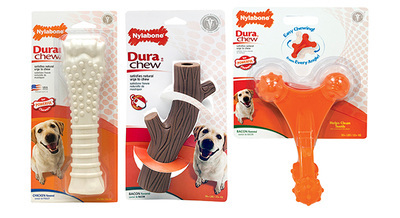 Nylabone brand has many options with different features (look for the ones marked with “Durachew” rather than the edible variety). Your dog may eventually work any of these options down to a nub if he’s a strong chewer, so be sure to inspect them carefully for splintering pieces and to throw them out when they become too small. You want to make sure that any of these are bigger than your dog’s muzzle so they cannot prop his jaw open or get lodged in his throat. All of these varieties will last a long time for most dogs, so it’s better to spend your money here. 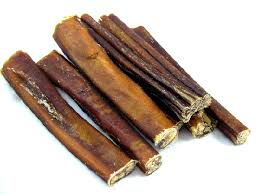 You can balance out these durable chews with some other natural edible chews, like bully sticks or pig ears, but beware that your dog will swallow these chews so supervision is necessary and if your dog has a sensitive stomach, try only one at first to see how he will react (if it causes diarrhea or vomiting, stop use). I’m not a big fan of rawhide for several reasons: it’s harder for many dogs’ stomachs to process so can often result in gastric upset and it’s sticky when soaked with saliva and leaves a residue on your belongings. 2) Kongs. 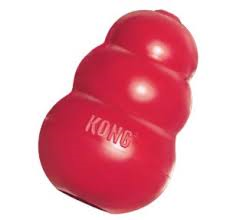 I’m a BIG fan of the Kong brand – they just have so many durable options. The Classic toy (that looks like a beehive, seen below) can be used for fetch and interactive play, but it’s also great for stuffing with treats to occupy your dog when you leave or are trying to get some other stuff done. You can fill it with dry treats that will drop out when he bounces the toy around, or for a really fun treat, you can stuff it with some soaked kibble, mashed banana or sweet potato, some chopped apple or blueberries, and freeze it overnight to create a healthy “puppy popsicle.” These “beehives” come in the Classic red or the Extreme black – the black is considered the most indestructible. Kong also makes a really great interactive toy called a Wubba – with a bulb at one side and dangling tentacles on the other (or the Tugga Wubba comes with a straight tube in the middle and tentacles on each end), this visually gets your pup’s attention, is easy to play tug with, and can also be a great projectile for a game of fetch. 3) Balls. Many dogs like to play fetch and a ball is the first thing many of us think of when playing this game. Some balls are better and more durable than others, especially if you have a dog who likes to chase after the ball but then retreat with it to mouth/chew on it. 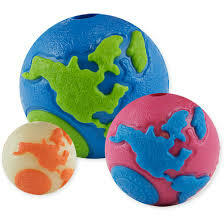 Planet Dog’s Orbee-Tuff brand makes several fun varieties, as does Kong. For anyone with shoulder or elbow problems that make throwing difficult, or for anyone who isn’t Andy Pettitte, a Petmate Chuck-It! 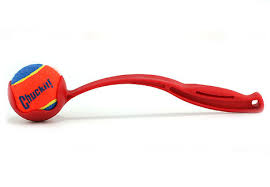 is a great tool – it’s basically a stick with a receptacle for a ball at the top, and you can use this stick to sling the ball great distances. Tennis balls are usually cheaper and very popular, but if your dog is a chewer beware that chewing off and ingesting the fuzz on a tennis ball can create gastric upset so you won’t want to leave him with a tennis ball unsupervised. 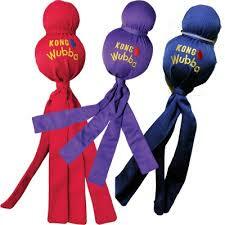 ​4) Toys for Tug. Sometimes a good game of tug will really help to get out some of that pent-up energy, and you can use tug as an opportunity to set some boundaries with your dog – i.e. if you start and end tug it plays to your role as the leader, you can throw in lessons in patience as your dog waits for you to start up again, and you can work on “drop it” or getting your dog to release an object on command. 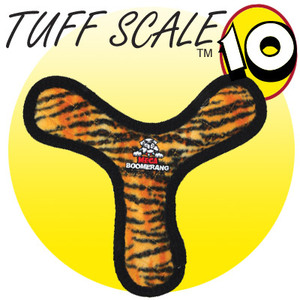 Pick tug toys that will hold up to a lot of pulling. The Kong Wubba I mentioned is great, or the brand Tuffy’s makes Bowmerangs and Tug-o-Wars as well as toys shaped like adorable octopi and bunnies made from a durable material that holds up well to a dog’s teeth (even for tug play between two dogs). 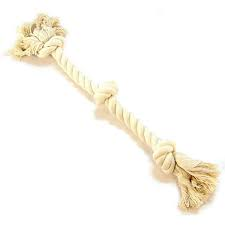 You can also use large and tightly wound fleece braided tugs and rope toys (just don’t leave your dog alone with these toys or they can pull apart and ingest the strings). There are so many bowls to choose from out there. Ones made of metal or ceramic are more durable and less likely to promote bacteria growth than bowls made of plastic or vinyl. 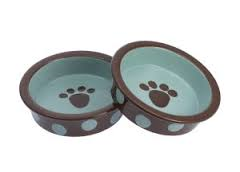 Select a size that is big enough for your dog’s muzzle to open in freely but small enough that your dog can’t fit his two front feet in to dig (which can be a common occurrence for some dogs with their water bowls, especially in the summer when they enjoy the splashing water). 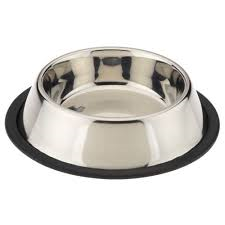 When purchasing metal bowls, you will find two different styles - one for food, and one for water (which usually has a wider, rubber-footed base - making it less likely to tip). You can even find feeder sets, with matching food and water bowls in a wooden or metal stand. It’ll be important for your dog to get comfortable with regular brushing, especially if he has a thick coat that sheds off in tufts all over your floors and furniture. These tufts appear when the hair is dead, and carrying that dead hair around can promote bacteria and create uncomfortable knots and mats in the coat. 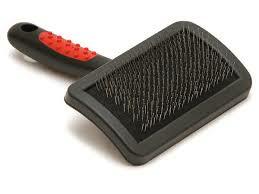 If your dog has one of these thick undercoats (like Corgis, Shepherds, Collies, Huskies, and Labradors to name a few), a tool like the Fur-minator will help pull up all the dead fur from underneath before it gets to the point of creating tufts or mats. If your dog has a finer coat (like Yorkies and Shih Tzus) or a shorter coat (like Boxers or Pit Bulls), a slicker brush or grooming glove will do. 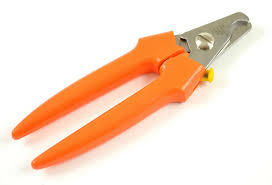 It’s also important to trim your dog’s nails regularly. Extra long nails can not only scratch you, your guests and your wood floors, but can also make walking uncomfortable for your dog since his nails do not retract. 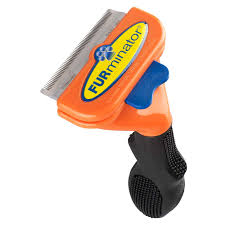 Investing in a good nail clipper (either guillotine or scissor style, my personal preference) or nail file (like the Drummel) is a good idea, and so is practicing nail clipping/filing with your dog on a regular basis. Since many dogs are uncomfortable with having their nails clipped (and their owners are uncomfortable with doing the clipping), we tend to only clip their nails when we absolutely have to – but doing it this way, only occasionally and with a lot of pressure to sit still and get it done, can lead to your dog being more afraid. If you make grooming and nail-clipping a regular occurrence, we can make it a positive thing for your dog that he will learn to easily tolerate and maybe even enjoy! Ask me how and I can show you! 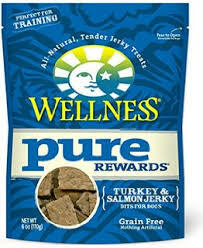 Having the proper nutrition is critical in helping your dog live a long and healthy life. With so many varieties of food out there, it may be hard to choose. But I strongly recommend a brand that is composed of mostly whole foods, natural (or even organic) that are free of fillers and by-products that make it difficult for your dog to process (like corn, wheat or soy). The less ingredients the better, unless all those ingredients are things you can identify and pronounce – like chicken/beef/lamb/salmon, fruits (such as blueberries, apples, cranberries) and vegetables (such as sweet potato, pumpkin, carrots, celery, snap peas). 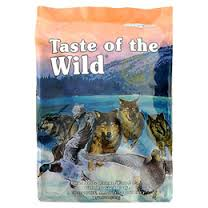 Brands such as Blue, Taste of the Wild, Canidae, Wellness, and Fromm’s are wonderful examples. These brands of food will cost more than the brands found in your big-box grocery store (like Iams or Purina), but when you have a nutrient-dense food with these real ingredients, you don’t need to feed your dog as much because they are getting the nutrition they need (which means you’ll be buying less of it). Think of it like our human food – if we eat healthy meals with a lot of organic proteins, vegetables and whole grains, we feel fuller longer (and even more appropriately energized) than if we eat McDonalds or Arby’s all day, which leaves us feeling sluggish and greasy. The same rings true for dog treats. You will probably want to use treats to provide positive reinforcement while your pup is learning (in addition to your praise, pets, and happy body language of course), but it’s important to choose treats that are not going to pack on the pounds and slow down your dog’s digestive system. Some treats like MilkBones and Pup-Peroni are popular, but giving your dog plenty of these during training is like giving your child cookies or ice cream several times a day. 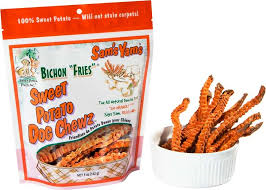 Instead, there are many brands of treats out there that have whole food ingredients, such as freeze-dried liver or chicken, sweet potatoes or bananas – and you can even use your dog’s kibble for treats too! 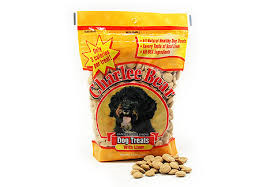 Find treats that have a low calorie count – such as Charlee Bears liver treats – so you don’t have to feel guilty about using several of them in one training session. 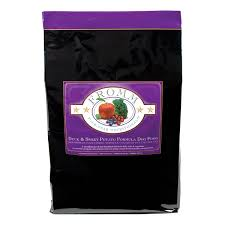 And better yet, use whole foods as treats – such as chopped apple, carrots, and blueberries! Don’t forget to carry little plastic baggies with you to clean up after your dog! Leaving feces behind can spread diseases such as Giardia, Hookworms or Roundworms, or the Parvo Virus (which can be a life-threatening concern) for your dog or others to pick up. And since that results in an unhealthy dog and a big vet bill, it’s much easier and safer to just carry some bags with you. You can use a store brand of waste bag rolls (some even come with carriers that clip onto your leash or belt loop for easy access), or you can use leftover plastic bags from your carry-out dinner. Whichever you choose, please be kind to the rest of us and pick up after your dog! Thank you! 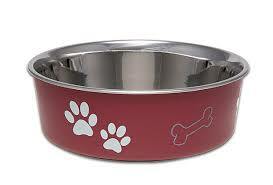 There are a WHOLE bunch of other doggie items out there – just go to a pet store and you can be bombarded with options. The ones mentioned above are just some of my favorite necessities, but there are many reputable and wonderful items out there. For help in selecting or using any of these items for training, please contact me at (845) 549-0896 or maria@mghcanineconsulting.com. I am not only here to give you this information, but to help you apply it so you can find a harmonious relationship with your four-legged friend!